Objective: To compare various previously validated assessment tools for intracorporeal suturing. The aim of the study was to evaluate the correlation between 4 assessment tools and review the advantages and disadvantages of each of them as a tool for objective assessment. Methods: The study included fifteen senior (PGY3-5) general surgery residents participating in a workshop in advanced laparoscopy. After a demonstration of laparoscopic suturing technique, all participants were asked to perform an intracorporeal suturing task using the standard Fundamentals of Laparoscopic Surgery (FLS) model. Resident performance was evaluated using 1) the FLS scoring system; 2) a 29-point laparoscopic suturing checklist; 3) the Objective Structured Assessment of Technical Skills (OSATS) global rating scale; and 4) the Imperial Collage Surgical Assessment Device (ICSAD). Assessment was performed by 2 laparoscopic surgeons with extensive experience with intracorporeal suturing. Spearman’s rank correlation coefficient was used to compare the scores generated by each of the assessment tools. Results: There was a significant correlation between the FLS normalized scores and scores from the Moorthy’s Laparoscopic suturing checklist (rs=0.838, p=0.01). Similarly, the FLS scores correlated significantly with scores obtained using the OSATS global rating scale (rs=0.874, p=0.01). Finally, FLS normalized scores had a strong negative correlation with the various measures of analysis of motion as recorded by the ICSAD (rs= -0.986, p=0.01 for total time (seconds); rs= -0.961, p=0.01for total path length (meters); and rs= -0.883, p=0.01 for total number of movements). 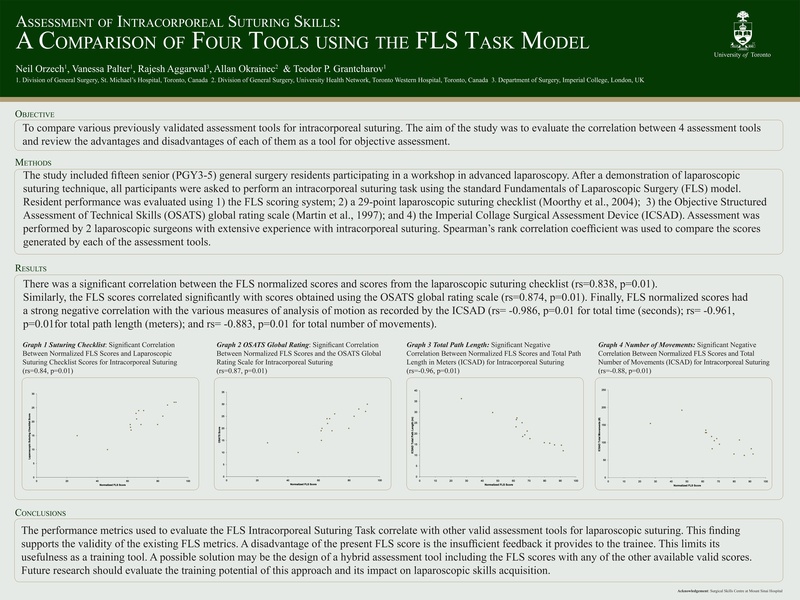 Conclusion: The performance metrics used to evaluate the FLS Intracorporeal Suturing Task correlate with other valid assessment tools for laparoscopic suturing. This finding supports the validity of the existing FLS metrics. A disadvantage of the present FLS score is the insufficient feedback it provides to the trainee. This limits its usefulness as a training tool. A possible solution may be the design of a hybrid assessment tool including the FLS scores with any of the other available valid scores. Future research should evaluate the training potential of this approach and its impact on laparoscopic skills acquisition.